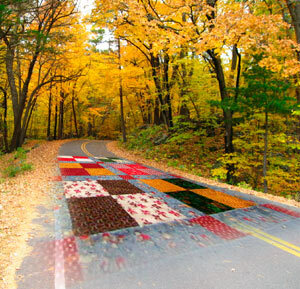 Welcome to Quilting Pathways . . . offering interesting places & things to see and do for people who enjoy scenic travel . . . and for the travel-minded quilter and companions. What do quilters do when they travel and can't quilt? They stop at fabric shops, quilting supply shops, quilting boutiques, quilting shows, quilting bookstores, and other waysides to get their quilting fix when they are away from home! Sometimes a poor spouse or significant other is trailing along behind - consigned to that special chair in quilt shops reserved for their ilk - where they sit resigned to serve their sentence till the quilter is through exploring. This website aims to make that S.O. a happier camper by profiling scenic trips and destinations that offer lots of interesting things to do and see . . . that have nothing to do with quilting (but pssst, also offer some neat stops and shops to fill that quilting void!). See our Scenic Drives & Byways pages, currently featuring the Lake Superior Circle Tour, the Great River Road Scenic Drive and scenic drives through the Arkansas Ozarks and Ouachita Mountains. Post a notice of your quilting event, retreat, or shop hop here. We couldn't get away with talking about quilting and travel without including something about traveling to the North American Quilting Mecca - Paducah, Ky and the Annual Expo of the American Quilters Society. If you've never gone to Paducah these pages will give you a taste of what it is like. We'll also profile some other quilting shows that Jo and her friends have attended and found worthwhile. Also check my blog post on the 2017 Paducah Quilt Show & Convention for details and also tell me "Do you think the Paducah Show has changed?" now that AQS is offering so many other Quilt Week shows around the country? Are quilters birds of a feather or is the "cult" made up of a wide variety and kinds of people? For fun, we offered an opportunity to take a little quilters survey that includes a personality quiz patterned after the famous Myers-Briggs Type Indicator ®. People who took this questionnaire, helped us answer the burning question: "Is there a quilting personality or not!" You can see the results of our Quilting Personality Study here. If you need a hotel or motel while you are traveling our Quilted Highways, try our internet hotel motel booking service for attractive rates. As this is a work-in-progress you'll find new things from time to time. Our Traveling Quilter Blog is one of them. This spring we are thinking of heading to some quilting shows in Texas and to spend some time touring the scenic Texas Hill Country area. Later of course we hope to make the Paducah AQS Show. We also have a comments area on our blog and would love to hear from other quilters and their traveling companions. Looking for an interesting summer or fall trip?